This paper presents a framework of the evolution of information and communication technology (ICT) applications in agriculture and rural development based on comparative experiences of South Africa and Kenya. The framework posits that full deployment of ICT in agriculture and rural development will be a culmination of several phases of changes that starts with e-government policy design, development and implementation. 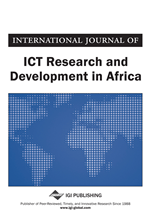 The paper argues that ICT use in agriculture and rural development is a powerful instrument for improving agricultural and rural development and standards of living throughout Sub-Saharan Africa. However, success in greater application of ICT in agriculture will require addressing impediments to adoption and diffusion. Such impediments include the lack of awareness, low literacy, infrastructure deficiencies (e.g. lack of electricity to charge electronic gadgets), language and cultural barriers in ICT usage, the low e-inclusivity and the need to cater for the special needs of some users. The paper reviews successful applications of ICT in agriculture and urges greater use of ICT-based interventions in agriculture as a vehicle for spurring rural development in Africa. The rapid growth in the use of information and communication technologies (ICT) by governments, businesses, private institutions, and civil society has led to key socio-economic developments globally. This widespread diffusion of ICT has enabled more efficient local and global linkages between governments, businesses, and ordinary citizens. It has also led to a significant transformation of people’s livelihoods and the development of “information societies” and “knowledge societies”. As the modern ICT and related traditional technologies converge, both the effectiveness and efficiency in public service delivery, business performance, global communications, and citizen participation in governance and policy development issues have increased tremendously in the newly emerging information and knowledge societies. Although developed countries have led the world in ICT use for over two decades, the past decade has seen unprecedented growth in ICT usage by developing countries. The later now boast the fastest growth in ICT penetration and related productivity growth has surpassed that of developed and transition countries (Mathur, 2009). Today, public information and services that were difficult to access a decade ago are readily available especially to rural and marginalized communities in Sub-Saharan Africa (SSA). In remote rural locations in SSA where communication would normally take several weeks to complete, the advent of mobile phones, instant short messaging system (SMS) and multi-media message system (MMS) has eliminated waiting periods to relay important decisions (Tyler et al., 1999). Modern ICT such as Internet, email, 3G and 4G mobile phones, personal digital assistants (PDAs) and social networking via u-tube, twitter, my-space, face-book, etc. have extended the communication frontiers in the 21st century reaching previously excluded communities. These modern ICT have enabled developing countries to “leap-frog” agriculture and rural development. As a result increasing attention is being focused on the role ICT could play in promoting access to markets that is critical to the achievement of agricultural commercialization, food security, and poverty alleviation in SSA. In South Africa and Kenya, the relationship between the government, businesses and citizens changed significantly when e-governance was introduced in 2001 and 2007, respectively. Fuelled by events of the World Summit for Information Society in 2002, and a restless society frustrated by continued poor public service delivery more than a decade after Independence in 1994, the government of South Africa (GSA) adopted e-government with the aim of rectifying the way it interacts with its citizens. In Kenya, e-government was introduced to facilitate the speedier delivery of services as part of the civil service reform process to accelerate citizen’s access to public services. It was also seen as a medium for reducing unofficial hurdles in accessing public services. E-government which involves the use of the Internet and World Wide Web (WWW) to deliver online public information and services, has helped a number of countries to improve the quality of their public services, by making them faster, dependable, available in real-time, and more citizen-centred.